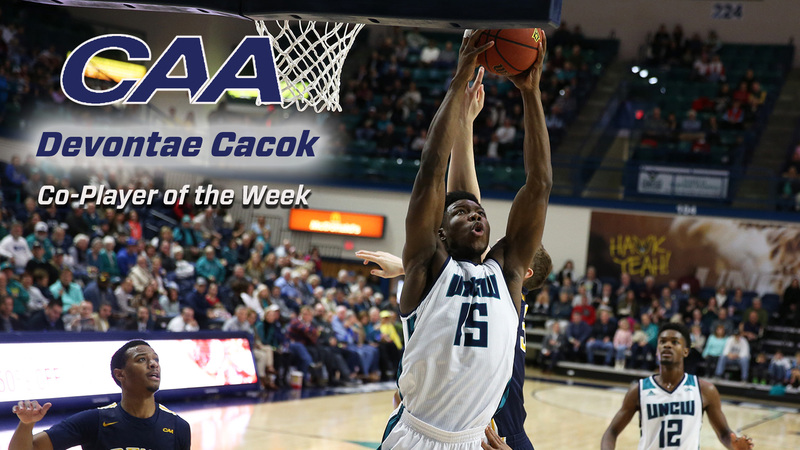 WILMINGTON, North Carolina – Newly-minted UNCW rebounding king Devontae Cacok of UNCW has been named the Colonial Athletic Association's Co-Player of the Week after averaging a double-double in games against league rivals Delaware and Drexel. The 6-7 240-pound Cacok averaged 18.0 points and 12.0 rebounds in the two contests and leads all NCAA Division I players with 11 double-doubles. He scored 12 points and grabbed 12 boards in a loss to Delaware on Thursday before pouring in 24 points and snaring 12 rebounds in Saturday's big win over Drexel. He shot 55 percent from the field (11-of-20) and 73.7 percent at the free throw line (14-of-19) for the week. A native of Riverdale, Ga., Cacok has posted a double-double in all five conference games for the Seahawks. He has racked up 1,067 rebounds and surpassed Keith Rendleman (1,055 | 2009-13) atop the chart. He also moved past Drexel's Samme Givens into sixth on the CAA's career rebounding list. Cacok ranks fifth in the NCAA ranks in rebounding at 11.7 rebounds per game and stands third among all active players with his 1,067 boards in 114 career appearances. He has scored 1,382 points for seventh on UNCW's all-time scoring list and owns 47 double-doubles over four seasons. Cacok shared the honor with James Madison sophomore guard Darius Banks, who scored 22 points, including 16 in the second half, and grabbed 11 rebounds in the Dukes' 74-65 victory over Towson on Saturday. CAA is a joke! They are chicken sh*t for making him a co-player otw. (01-15-2019 11:09 AM)Seahawksilver Wrote: CAA is a joke! They are chicken sh*t for making him a co-player otw. They always do that, across all sports. Agreed; it's absurd. I saw several in the past that only had 1 player. If anyone is deserving of holding that title alone, it is Devontae. The CAA cannot even do player of the week right.